Our family just moved to the great city of Chicago. We love it, and we’ve been so busy! There’s always something to do here and it’s so easy to get around on foot, train or by car (if necessary). Between all the unpacking and exploring, I’ve managed to squeeze in some baking and sample some really good cookies. A friend gave me this cookie last week. It was made by her friend who wraps each cookie individually and shares or sells them. He obviously puts a lot of love in his baking, and his cookie seems like it might be reminiscent of the ones they used to serve in Chicago public schools. 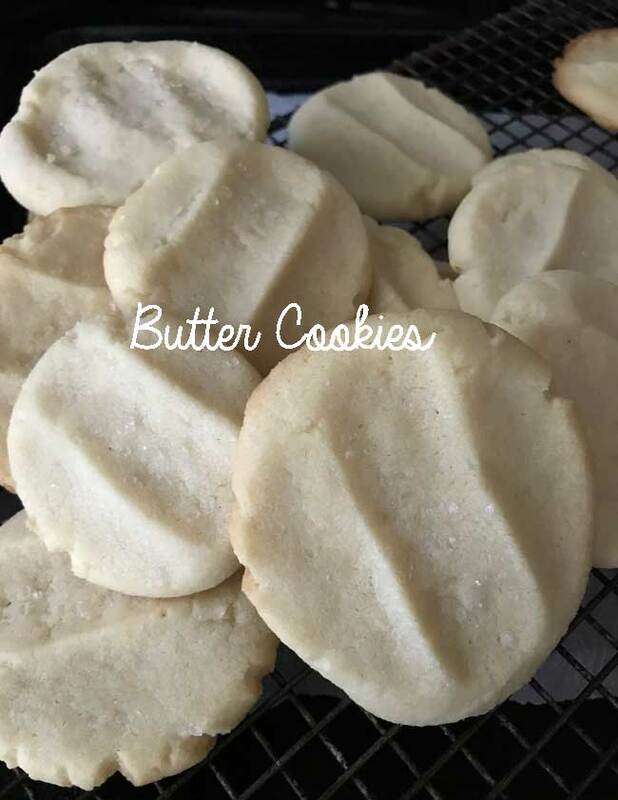 It’s a cross between a butter cookie and a sugar cookie and is made with just four ingredients — butter, sugar, flour and vanilla. There’s no chemical leavening agent, but the cookies bake up light and crispy thanks to the air that’s whipped in with the butter and sugar. The texture is much lighter than shortbread, but the butter flavor comes through loud and clear. I made a batch yesterday using a mishmash of different CPS butter cookie copycats. Mine are smaller than the originals and not exactly the same, but they got a vote of approval from a friend who attended CPS. So even if they’re not the same cookies, they’re good on their own merit. A few recipe notes. I used Danish butter from one of my neighborhood grocery stores, Treasure Island. 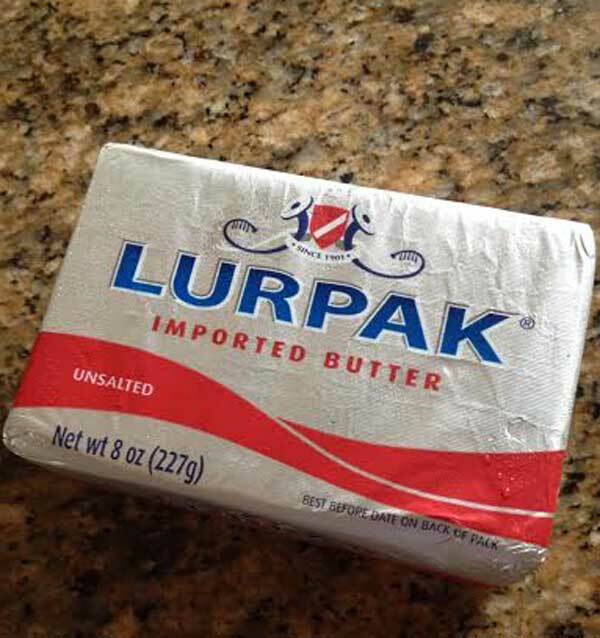 It’s called Lurpak, and I know we’ve discussed it before, but I had trouble finding it back in Austin. Apparently Treasure Island will be my new go-to source for butter because they had a nice variety of interesting ones including an Amish butter. 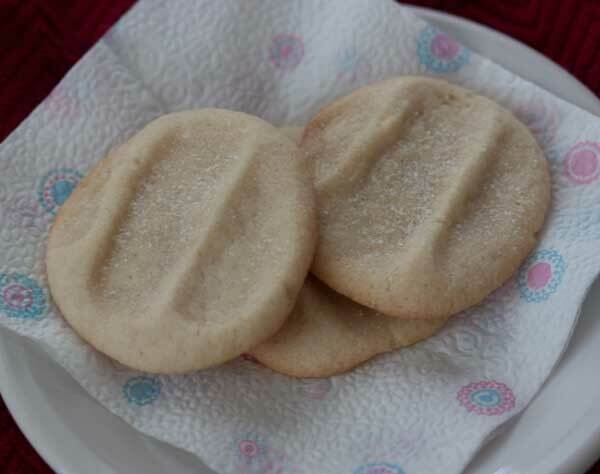 Also, I used unsalted and added my own salt to the recipe, but most shortbread type recipes advise using salted. For the flour I used regular old Pillsbury’s Best bleached. I normally used unbleached, but I figured CPS probably used bleached and from my experience, cookies with bleached flour don’t spread quite so much. The key is getting the amount of flour just right so that the cookies don’t spready too much (too little) or the dough is too dry (too much). That can be tricky since volume measurements of flour aren’t always accurate, so if you have a scale it’s best to weigh, but also go by the feel of the dough. The dough should be stiff enough to work with and not require any refrigeration. Update: I’ve made these over and over since first posting and have added a few more tips in the notes section. 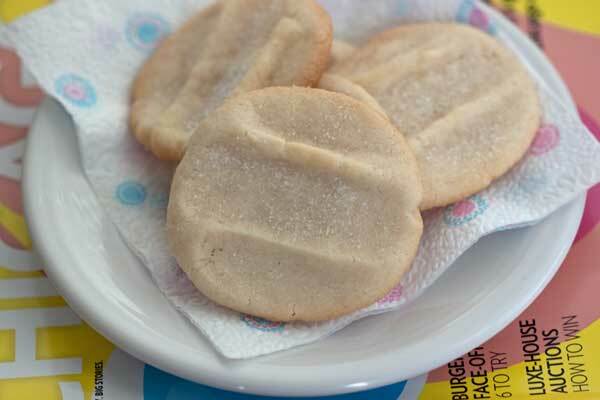 A recipe for cookies that are supposed to be similar to the ones they used to serve in Chicago public schools. Preheat oven to 350 degrees and have ready an ungreased or Silpat lined baking sheet. With an electric mixer, beat the butter and sugar for about 5 minutes, scraping bowl often, until very light and fluffy. Beat in vanilla and scrape sides of bowl again. Gradually stir in flour, ½ cup at a time, until a smooth dough forms. Using a generously rounded tablespoon, scoop up dough and shape into 24 balls. At this point you can bake the dough or chill it until ready to bake. Arrange the dough balls on baking sheets spacing about 2 ½ inches apart. Dampen fingers and press index, middle and ring fingers into each dough ball to make indentations and flatten. Bake for 12 minutes or until lightly browned around the edges. Carefully transfer to a cooling rack and let cool completely. **If using unsalted butter, add ¾ teaspoon of salt when you whip the butter and sugar. For the flour, I used two (5 oz weight/140 grams each) cups (280 grams total or 140 grams per cup). Since flour weigh varies cup for cup, I recommend weighing. If you don’t have a scale, go by the consistency of the dough. It should be a nice, workable consistency neither dry nor requiring refrigeration. Also, I recommend you add the flour gradually. Start with 1 1/2 cup and then add the flour a few tablespoons at a time stirring until the dough is just firm enough to be shaped into a ball. Use the best butter you can get find. The Danish butter is good, but KerryGold works really well, too and gives the cookies a yellow hue. Penny, that’s a good question. I’ve never tried. My advice is to start with this size batch and if you like the results, try doubling. This recipe makes great cookies, but sometimes my cookies are flatter than others. I’ve found I get different results with different brands of butter, flour and most importantly, the amount of time spent whipping the butter. You really do have to whip as directed so the cookies will be light. Good luck! Thank you for this simple, yet STUNNING cookie. Amazing flavor and quickly out together. I was wondering which city/state was going to be the lucky recipient of your move. Glad to read that you are getting settled in. Glad you are enjoying Chicago Anna! I lived in Peoria, IL for my first 32 years. We moved to PA almost 10 years ago. If you say you are from IL here, they always assume you have moved from Chicago :). Cookies look great! How exciting! We just came back from a trip to Chicago. I hope you will be trying to duplicate some of the treats from Sweet Mandy B’s! Kelly, I’ve seen some versions that have either all powdered sugar or a mixture of the two. I’m going to try that one soon, but these were such a hit that I’ll probably make another batch using this same recipe and testing with different butter. I’m wondering if the special Danish butter is really what made them so good. The people I made them for are still talking about them. Looks like a fun, simple cookie! Welcome to the upper midwest, from the Milwaukee area! I’ve been making a variation of this, with powdered sugar, as cut outs. Looking forward to trying with granulated sugar! These look wonderful! Can’t wait to hear about your cooking/eating adventures in The Windy City…. Congratulations on your move to Chicago! Sugar is optional. I actually like sprinkling it on the hot cookies because it just melts a little and adheres, whereas if you sprinkle it on before, it soaks in. But that sugar dusting was just an optional last minute thing and is not necessary. I know I would love these! The indentations from the fingerprints make them especially charming. Did you sprinkle the top of the unbaked cookies with sugar? It looks like you may have in the pictures. So happy to hear you and your family are enjoying your new home! Oh my, those cookies look absolutely delicious! I will be making these this weekend for sure.